Since we’ve been working like fiends on the design and construction of the Proximity Hotel and Print Works Bistro, we’ve been dining at Lucky 32 a lot. We like it and it’s right next-door. The food and service at Lucky’s is better than ever. I think we’re safe in saying that, because we’re pretty tough customers. Karen Walker is back as General Manager, and Jay Pierce has been the Chef there now for a number of months. We’ve given Jay a lot of latitude to use as much local food as he can get and to cook honest American fare with a Southern reference. He’s using this elbow room and knocking it out of the park. Jay is also working with Russell Shinn, the Chef in Cary, to update our recipes. Shane Garrity leads the great team at Lucky’s in Cary. The Print Works Bistro and Proximity Hotel are in a “Soft Opening” phase, which is sort of like a previewof a play. We’ll fine tune the show, let her blossom over the next few months, and call her “open” in early January. The soft opening means that we only take a few tables in Print Works each evening and won’t open for lunch for a while. We’ll wait until well into next year to open for breakfast. The new hotel and bistro have turned out to be even more comfortable and good looking than we anticipated (I’m sure we are totally objective about this–just like we are about our children). Read on and you’ll learn of a dozen ways that we might be able to make your holidays even more joyful. You’ll also get further updates about our new arrivals, and you’ll hear about this brave new hotel and restaurant playing host to an amazing party. For the first couple of months of our “soft opening” preview stage, we’ll be working with our team to perfect our game. During this phase, we are offering “Preview” rates starting at $119 on weekends and $144 on weekdays through January 12, 2008. In our last letter, we promised to tell you more about how we put action behind the words of our Sustainable Practices Initiative with our design and construction. First of all, we will meet the U.S. Green Building Council’s Leadership in Energy and Environmental Design (LEED) Gold level of certification. There’s only one other hotel in the country that has accomplished that. LEED is a nationally-accepted rating system for the design, construction, and operation of high performance green buildings. Projects are awarded Certified, Silver, Gold, or Platinum certification depending on the number of credits they achieve in areas of human and environmental health. • One hundred rooftop solar panels, covering 4,000 square feet, will heat enough water for 60% of the hotel guests’ needs, which is equal to about 100 average households. • Our Otis Gen2 elevators are the first elevators in North America that generate electricity as the cab descends to use for the ascent. • Better air to breathe is thanks to efficiently circulating large amounts of outside air throughout. This creates 60 cubic feet per minute of fresh, filtered outside air into each guest room, keeping every nook and cranny of the hotel filled with fresh air. • We restored 700 linear feet of the stream that runs by the Bistro. • Recycled materials comprise about 25% of the building materials, including concrete that contains 4% fly ash, a coal combustion byproduct. • We recycled 75% of the construction waste, diverting it from landfills. • Use of geothermal energy for the restaurant’s refrigeration equipment, instead of a standard water-cooled system, will save lots of water. Our friends Matt Lee and Ted Lee are coming back for a visit. And you are invited! These guys are just too talented. They grew up in Charleston but now live in New York, and they love to promote Southern cooking. You have probably read their frequent food articles in Travel + Leisure, Food & Wine, GQ, New York Times, or Martha Stewart Living.Or you might have seen them on television. Their cookbook, The Lee Brothers Southern Cookbook: Stories and Recipes for Southerners and Would-be Southerners,won the 2007 James Beard Cookbook of the Year Award. The Lee Brothers and Lucky’s Chef Jay Pierce have collaborated on a special featured menu with some of our favorite recipes from their cookbook. The menu runs November 1-January 8. In addition to enjoying these yummy recipes, you can also pick up copies of the cookbook at either Lucky 32. To meet Matt and Ted in person and get a cookbook signed, come see us at Lucky 32 in Greensboro on November 29 from 6:4-8:00 p.m., and in Cary on November 30 (same time). Take a break from the hot kitchen on Thanksgiving. Enjoy Green Valley Grill’s wonderful cooking with Thanksgiving-to-Go. Place your order by 10:00 p.m., Sunday, November 18, then stop by the Green Valley Grill on Thanksgiving Day before 1:00 p.m. to pick up your juicy, wood-fired, rotisserie-roasted turkey with all the trimmings, including sides, salads, bread and dessert. To place your order, contact Green Valley Grill at 336-854-2015 or visit greenvalleygrill.com. While Lucky 32 and Print Works Bistro won’t be open, you can bring your clan to Green Valley Grill. The dining room will open 2-8 p.m. (with several turkey specials) and the bar will be open until 11 p.m. with our late night menu on both Thanksgiving and Christmas Days. To make your reservation, please contact Green Valley Grill at 336-854-2015 or visit greenvalleygrill.com. No time to prepare that covered dish? Let us cook for your office gathering or weekend party. In addition to our regular menu, we fix boxed lunches, larger “party” size portions and “Family Dinner” options. For lunch, just call us before 10 a.m. and you can pick them up between 11 and 11:30. If you would like more than 12 lunches, please give us 24 hours notice. The “One Stop Wines” are priced low. You call, we cook, and we bring your order right to your car. For complete Get Lucky & Go menus, visit lucky32.com. Folks really enjoyed our holiday teas the last two years. So it’s back! The story of The Nutcracker will delight all ages as we combine traditions of the holiday season on two Sundays, December 9 and 16, from 2 p.m. to 4 p.m. Dreams of dancing sugar plum fairies, toy soldiers and waltzing flowers inspired the special treats that will accompany your choice of tea, warm apple cider or hot chocolate. Afterwards each child can decorate an ornament and help our chefs make gingerbread houses; all accompanied by music and costumed characters. Then join Clara by the tree as she reads the story of The Nutcracker. Bring your camera to capture this magical holiday event. Cost is $35 for adults and children. Call Green Valley Grill at 336-854-2015 for reservations. Speaking of tea, our daily afternoon tea in the O.Henry Hotel Social Lobby will get a holiday twist with special tea and pastries. It’s a popular venue for groups of friends and families to meet and exchange gifts. Many mothers and grandmothers bring children in their holiday attire and take photos with our festive finery. Call Green Valley Grill at 336-854-2015 for reservations. Bring your bunch to Lucky 32 or Green Valley Grill for a grand ol’ time. At Lucky’s, you can order from our full menu in our private and semi-private dining areas. Plus, we offer reservations, call-ahead seating and a pre-ordering service that expedites service for larger parties. In Cary, our elegant semi-private dining room seats up to 50. Our Greensboro Lucky’s private dining room seats 8-10. Call one of our Lucky’s for more information or to make reservations, and visit lucky32.com for our full menus. To enjoy the menu of the Green Valley Grill, you can entertain an intimate gathering of 15 or a bash of 150 (or something in between) in the event spaces of the O.Henry. See photographs of the party spaces and check out the menus at ohenryhotel.com, or call the hotel’s events team at 336-544-9604. Please visit ohenryhotel.com to get our “Best Rate”and save up to $70. In addition to our Best Rate, youÕll get a $30 Amenity Voucher with a weekend stay (Friday, Saturday, or Sunday night) beginning November 16 until December 9, 2007 or any day from December 14, 2007 until January 6, 2008 with every room booked online at ohenryhotel.com.Or, get a great deal with one of our packages below. Holiday Shopping Package: Run away from home for a bit of shopping and pampering. Shop at more than 100 stores at Friendly Center! This package includes one night’s stay, a $30 gift certificate for Green Valley Grill, a $50 gift certificate for shopping at Friendly Center (with transportation), and a full hot breakfast buffet for $269 plus tax. That’s the Ticket Package: See Beautiful Star: An Appalachian Nativity at Greensboro’s own Triad Stage. It’s the reprise of last season’s acclaimed holiday event, November 23-December 23. This package includes one night’s gracious accommodations, two tickets, transportation to and from Triad Stage, a full, hot buffet breakfast, and a late check out, all for $259 plus tax. If you live in the Triad and your house is getting a bit crowded with visitors, send them to the O.Henry Hotel! We will pamper them and make them feel at home. You can use our Social Lobby as an additional living room, and let us do some of the cooking. Remember, go to ohenryhotel.com to get our Best Rate. Our special “Preview” rates start at $119 on Fridays, Saturdays and Sunday nights and $144 on Monday-Thursday until January 12, 2008. Book online at proximityhotel.comor call 336-379-8200. Make sure that 2008 will be your luckiest year ever and join us at Lucky 32 for New Year’s Day. We’ll feature our full menu plus some “good luck” special selections like collard greens, roast pork and hoppin’ john. According to folklore on New Year’s Day, eating greens brings paper money, black-eyed peas bring coins, and pork brings good health. We are honored that the planning committee for the venerable Blandwood Ball selected the Proximity Hotel and Print Works Bistro to play host. It will really be amazing! And it will raise money for a very important cause, Preservation Greensboro, a non-governmental, non-profit organization dedicated to saving Greensboro’s historic treasured places. Event co-chairs Randy McManus and Mary Hagan are working with our events team to create the shindig of the year with cocktails, butler-style dining and dancing on January 26. Learn more about it at blandwood.org. Preheat oven to 400 degrees. Combine all ingredients until well blended and pour into prepared pie crust. Bake in 400 degree oven for 10 minutes. Turn heat down to 350 degrees and cook for an additional 35 minutes or until a toothpick inserted in the center comes out clean. Cool pie on rack before refrigerating. Makes 1 pie. ©This recipe is property of Quaintance-Weaver, Inc. Unauthorized commercial use is forbidden. We reserve a limited number of tables so that everyone can be accommodated in a reasonable amount of time. Just give us a call and make a lunch or dinner reservation. You can also make online reservations for Green Valley Grill at greenvalleygrill.com. When you don’t have a reservation, and you are concerned about waiting, we offer a “Call Ahead” service. Just call us, and we’ll add your name to our waiting list (if we have one) so that any waiting will be kept to a minimum. You call, we cook, and then we bring your order right to your car. Let us cook for your picnic, in office lunch, or a dinner at home with the family with the “Family Dinner” options. Don’t forget our “One Stop Wines” that are priced low. For complete Get Lucky & Go menus visit lucky32.com or just give us a call. seasonal foods. 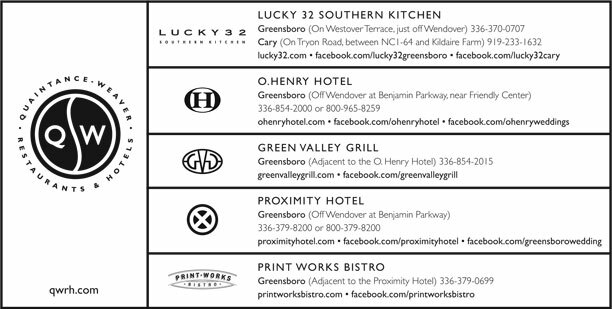 Please visit lucky32.com, greenvalleygrill.com and printworksbistro.com for the current menus.